Wooden toys are timeless classics, as are train sets. 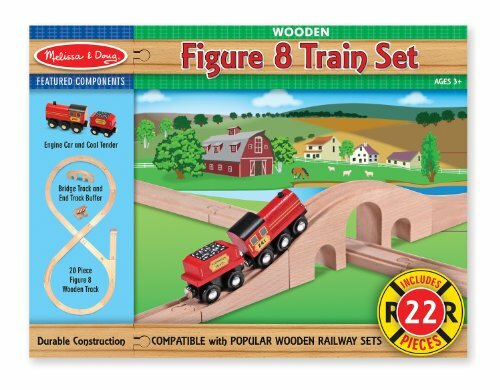 The toy company of Melissa and Doug recognizes this and have created a large line of wooden train sets. By encouraging hands on play, children engage their imagination. They also learn important concepts like problem solving and language development. Children are tactile learners: they need to be able to physically touch and see what they are playing with to understand it, and wooden train sets give them this opportunity. If you are looking to purchase a Melissa and Doug train set, here are three products to check out. If you’re not sure if your child is interested in trains, or ready for trains, a basic train set is often a good idea. For a relatively small price, you can introduce your child to the world of trains. 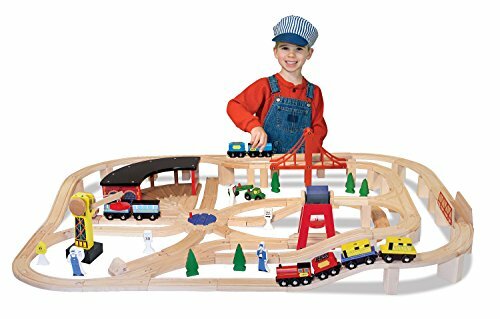 If your child becomes more interested in trains, all of the track pieces from this set can be used in other Melissa and Doug sets, so your initial purchase won’t be wasted. This set includes track pieces, train cars and a bridge. The track pieces create a figure 8 so there are two loops for the train to go around. The bridge piece can be moved to various parts of the track. Good as a starter set or as an add-on set. If you are using it as a starter set only, it only holds interest of young toddlers. Most train sets have city elements – buildings, stations and people. But this train set has outdoor elements which is a nice change of pace. There are 64 pieces that includes a large amount of track pieces, a train and a coal mine. There is also a large piece that includes two tunnels and a mountain for the train to go over. Because there are so many track pieces there are unlimited ways to configure it. The mountain setting offers an alternative to the traditional city setting. The train set is large enough to be used on its own, but also has enough different pieces to be used with other sets. This train set is large, so make sure you have enough space for it to be set up. To add more fun with our review that features the Melissa & Doug Mountain Tunnel Train Set, here is a short clip of the great fun time a kid is having, playing with the set. It offers a lot of space where your kids can move, inner part or outer part of the train set. The wooden train set is also compatible with most brands of wooden railway toys. If you are looking for a complete, comprehensive train set, this is the one to get. This deluxe train set is perfect if you know that your child loves trains and you have the money to invest in a train set all at once. The set has 100 track pieces and 30 accessory pieces. It includes bridges, a station, a crane and people. There are two trains included: a six-piece freight train and a four-piece passenger train. There is also a three-piece flatbed truck. It really does have everything that your child will need to capture his imagination. There are four basic track configurations and instructions on how to create them. Because there are so many elements, your child will be able to play with it from an early age and on into an older age. The train set is large and pricier than other sets, so make sure that your child is interested in trains to make it worth buying. When looking to purchase a wooden Melissa and Doug train for kids, there are many options, so it’s important to know what purpose you will need it for. Whether it’s a starter set for your young toddler, a mountain set for your adventurous child, or a deluxe set for children who loves trains, there is a Melissa and Doug train set that will meet your needs.